When Minnesotans passed the Clean Water, Land and Legacy Amendment in 2008 they did so with high expectations. As projects have moved forward throughout the state, so too have efforts to ensure that the projects are meeting those expectations. Every year we work with project managers and visit restorations around the state. 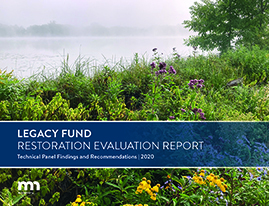 Highlights from the projects and lessons learned are communicated back to the restoration community to improve the quality of Legacy Fund restorations in Minnesota. Improved Project Teams – improve ecological outcomes through the use of more comprehensive project teams. Improved Documentation – ensure consistent documentation of essential planning and implementation data. Improved Restoration Training – practitioners will work best with comprehensive training showcasing current science based restoration practices, challenges and successes. Improved Design Criteria for Lakeshore Projects – projects with limited likelihood of benefiting habitat will not meet minimum design criteria. Improved Planning for Stream Projects - facilitate more consistent implementation of high quality stream restorations in the state. Evaluation Process Improvement – implementing strategic process improvements will allow for better documentation of program outcomes. High levels of suspended sediments in the Minnesota River degrade its aquatic habitat and quality for recreation. The Scott County Watershed Management Organization used a Stream habitat assessment to identify major sources of sediment like the eroding banks along Picha Creek. Working with cooperative landowners they were able raise the eroding creek bed and create a more natural floodplain. This work has resulted in reduced erosion and improve habitat along a half mile reach of Picha Creek. Targeted and well executed work on sites like Picha Creek can help us dial back the degradation of the Minnesota River. In 2011 Stearns County Soil and Water Conservation District worked with a landowner near Big Fish Lake to reduce sediment and nutrient rich runoff from entering the Lake. This project reshaped an old crop field to keep water and sediment in place and promote water soaking into the field. The 21 acre site was also enrolled in the Continuous Conservation Reserve Program and seeded into native prairie providing habitat for wildlife. Projects like this will help protect Big Fish Lake for decades to come. A century of development and agricultural drainage improvements in the rolling hills east of Rochester has increased the flow of water off the land and led to flooding and streambank erosion along Cascade Creek. In a targeted effort to stabilize the stream, improve water quality and control flooding, Olmstead County Soil and Water Conservation District worked with partners to build a new meandering stream channel. The new stream is stable and provides improved habitat for fish in the creek. Strong partnership between the SWCD, City of Rochester and other partners point toward positive outcomes for the stream restoration. Over a century of unregulated dumping of waste left a legacy of pollution in the 12,000 acres of wetlands, streams and bays making up the St. Louis River Estuary. Because of the pollution the River and Estuary were not a safe or healthy place for the citizens of Minnesota or the natural communities that once thrived there. A coordinated effort is underway to restore the Estuary. While there is work to be done, projects are shifting the legacy of the St. Louis River Estuary to one of a healthy river, a healthy harbor, and a resource for Minnesota for generations to come. In the early 1900s a 1¼-mile ditch channel was created to improve drainage from Grand Marais Creek to the Red River. This cut off flow to the lower 6 miles of the natural channel. Over the 20th century the straight-line ditch eroded to a steep channel with unstable banks depositing sediment into the Red River and creating a barrier for spawning fish. After more than a decade of coordination with state, federal and local partners and adjacent landowners, the Red Lake Watershed District spearheaded the effort to restore the lower Grand Marais Creek. Prairie restorations at Crow-Hasan Park Reserve are not a new thing. Over the last 50 years, more than 840 acres of diverse native grasses and forbs have been planted. The newest restorations include 250 acres of prairie made possible by funding from the Lessard-Sams Outdoor Heritage Council. As a part of the coordinated efforts to resotre the prairies, park staff have also been reintroducing animals. Today more than 100 Bullsnakes are living in the park. Park staff hope that over time the recently introduced plains hog-nosed snakes will also thrive in the restored prairie. In 2011 wind in St.Croix State Park created the opportunity to restore natural barrens-savannas, a disappearing and rare plant community in the state. These communities need fire, and with fire suppression in the 20th century they have become overgrown. Rare species including turtles, moths, butterflies and plants depend on these open habitats within St. Croix State Park. Through a combination of salvage logging, brush mowing, prescribed fire, and invasive plant control, managers are restoring the habitat structure and plant communities to provide a home for some of our states rare and threatened species. The Dakota County Parks system contains 6,000 acres of parkland with diverse landscapes including forests, savannahs, prairies, and wetlands. These parks not only provide outdoor recreation opportunities for the citizens of Minnesota, but are home to some of the State’s unique and threatened plants and animals including the Blanding’s turtle (Emys blandingii) and the Blunt-lobed Grapefern (Botrychium oneidense). Maintaining the quality of the parks is an ongoing priority guided by system wide and park specific management plans. With continued thoughtful planning and implementation from the natural resources staff, these parks can be a resource for Minnesota for years to come. Since 1967 Hayes Lake State Park has provided recreation opportunities and access to hundreds of square miles of wildlands. Historically fires moved through these lands burning up dead trees, popping open pine cones, and regenerating Jack Pine. Fire suppression in the area resulted in buildup of dead wood and little to no new Jack Pines growing. When deer populations plummeted park resource managers mobilized and accelerated logging and planting plans to restore the forests without deer eating the new trees. Through this adaptive management, resource staff were able to maximize the impact of Minnesota taxpayer Legacy dollars.